← FREEDOM! The Festival… Tony Kofi conjures Ornette, Xenicibis arrives & Black Top mash it up! 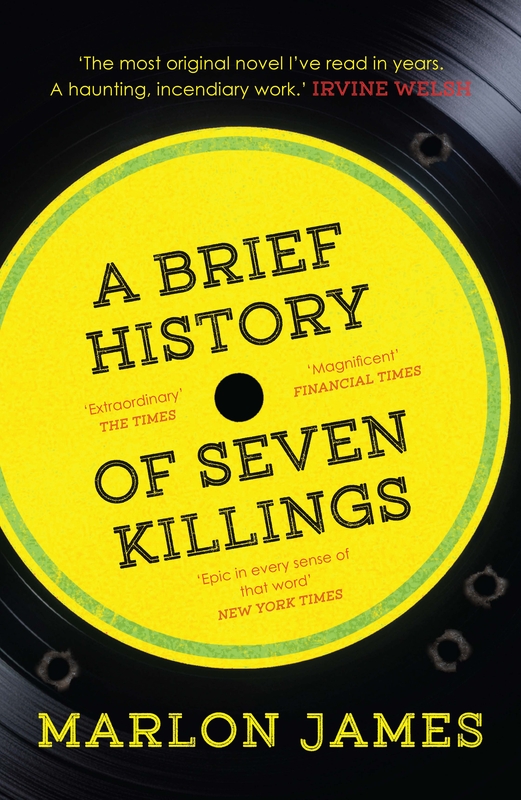 One evening, as I left the home of friend and fellow scribbler, Neil Spencer, he thrust a weighty tome into my hands and said, “You need read this but I want it back after.” The book was A Brief History Of Seven Killings by Marlon James. I’d read James’ first novel John Crow’s Devil – a deranged and dark tale of spiritual combat in a remote Jamaican hamlet – and had recently toyed with reading his award winning second book, The Book Of Night Women – “a devastating epic of savage history, relentless oppression, and souls that refuse to be shackled”. As I weighed A Brief History Of Seven Killings in my hand I knew I was about to be immersed no holds barred account of the most violent era in Jamaica’s post slavery history. 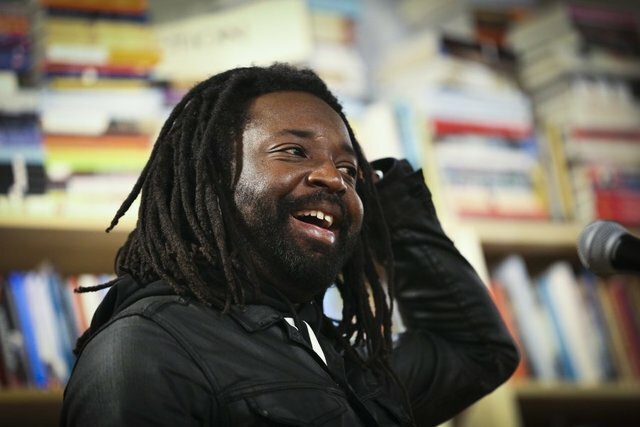 Over 686 pages Jamaican novelist, Marlon James, gives voice to a cast of players who were at the dark heart of the murderous political division and ‘Tribal War’ that punished Jamaica during the Seventies and led to the cocaine fuelled “Yardie” incursion into America’s drug trade in the Eighties. We drop into this brief history in December 1976. It’s election time and Jamaica is under Heavy Manners and Discipline and as I’m reading the book I cant help but match the timeline of my own visits to Jamaica with the events that unfold in the book. My partner at that time had grown up in Kingston. She was a leftist who supported Trevor Munroe’s Workers Party. Her parents were ex Communist Party members who had left England in the 50s traveling in the opposite direction to the Windrush generation. Her father had designed Marcus Garvey’s tomb and her mother was a doctor based in the clinic just down the road from Studio 1. Her patients came from the “garrisons” of Central and West Kingston. She passed away just last week aged 98 and lived face to face, on a daily basis, with the impact of the violence – political and other wise – that leaps from the pages of this book. 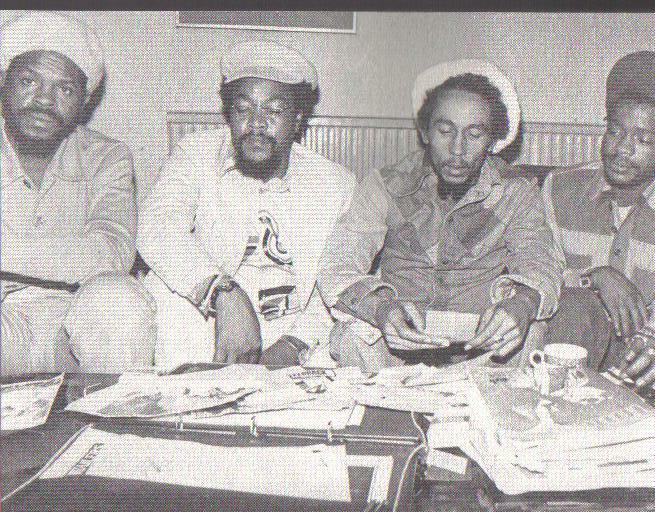 I also was an active leftist but one obsessed with Jamaican music… the vision of the Rastafari, the cultural militancy, the history, the journalist lyrics… the word sound and power. People had got tired me talking about the music and had pressured me to start writing. 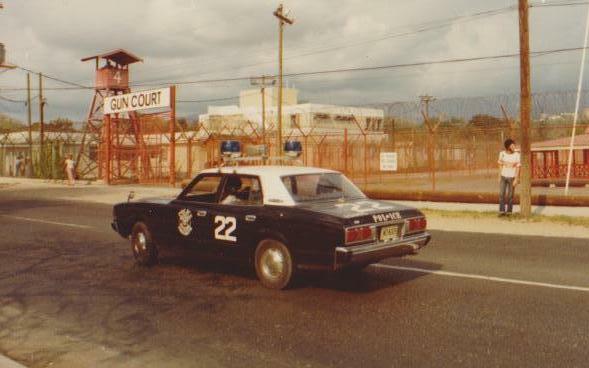 So, upon arriving in Kingston during the Xmas holiday 1976, post the election which the PNP had won, that’s what I did. Marlon James takes inside the minds of the political party enforcers – the soon to be “dons” – and it’s not pretty. As cocaine and free-basing enters the frame he paints a brutal picture of crazed Tony Montana style psycho-violence. As readers we are transported into PNP and JLP garrisons like Arnett Gardens aka ‘Jungle’ and Tivoli Gardens. We are taken into a warren of zinc fence lined streets and swept up in the dialogue and the intrigue. Following the failed assassination attempt of The Singer and two years of exile, we want to know why The Singer is back and there’s a Peace Truce in the making. What’s driven the leading enforcers from across the Party Political divide to sit and reason over a chalice while others in their ranks are plotting other wise. I never made it to the Peace Concert in April ’78 but Neil Spencer – as editor of the NME- did. 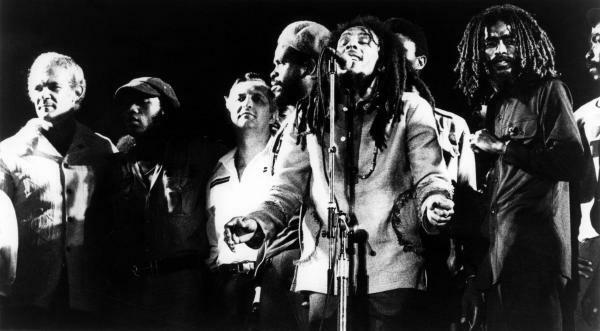 It was an event where Peter Tosh berated both Manley and Seaga and it earned him a brutal beating at the hands of the police. I watched the concert on video. 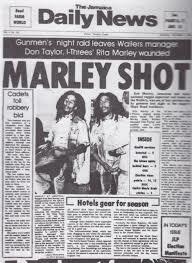 Marley was a man possessed and flanked by the baddest gun men in Jamaica he forced Manley and Seaga to join hands. Lightning flashed and thunder roared. Ironically, or maybe predictably, 85 years old CIA-aga is one the few people on that stage still alive. As these events evolve in the book I became fixated on who was who. Who in this book was Bucky Marshall, who was Claudie Massop, who was Tony Welch, who was Tek Life? Is Nina Burgesss real or is she a character in the novel who represents fear? She looked into the eyes of the man who orchestrated the raid on Hope Road and wisely fled. I have to believe, in real life, that man was Lester Coke aka Jim Brown – “Don Of Dons” and father of the infamous Christopher ‘Dudus’ Coke. I always thought he was the same Jim Brown that appeared on the odd 7″ Studio 1 single but apparently it’s not – he’s just another fan of the movie star and NFL legend. 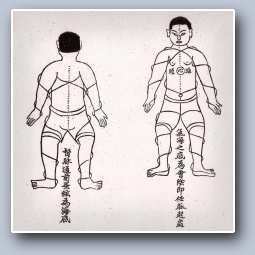 I have my own memories of these times. Fear and suspicion was everywhere. We once went to deliver a sack of leather footballs to a group of youth in a small ghetto community near the University campus at Mona. The balls had been bought with money raised at the youth club I ran in North London and the plan was to deliver them to where the local youth hung out – “Style Corner”. Our enquiries amongst the locals as to the whereabouts of “Style Corner” were greeted with a mix of frosty suspicion and open hostility. Two white people delivering gifts to the local youth – couldn’t be good. It had to be payment for some kind of badness. Time had to invested in explaining how it had all come about. Eventually, we made our delivery to a bunch of grateful, football loving teenagers. It’s not one of the killings in this book but, for me, one of the most painful experiences of loss during the early Eighties was the killing of the poet Michael Smith. Mikey was stoned to death by a gang of JLP supporters on a government work detail. 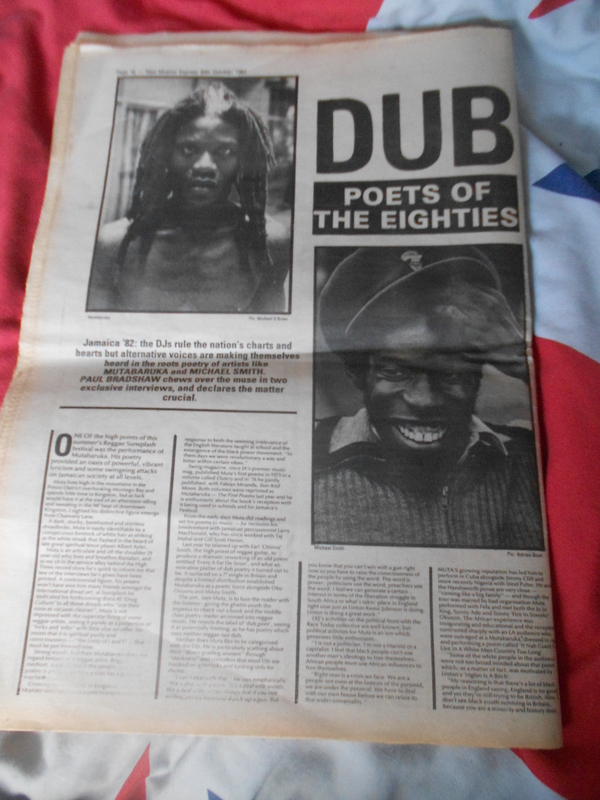 I’d spent time with Mikey interviewing him up in Red Hills for an NME piece on dub poetry. After the interview we were sat in the shade quietly enjoying a smoke and sipping on a Red Stripe.The sound of Count Ossie came up on one side of the mountain and Light Of Saba on the other. It was a deep moment. His death was a huge loss to the culture of Jamaica but despite demands for a statement from Prime Minister Seaga, a man who claims to have a deep passion and knowledge of Jamaican culture, there was nothing but silence. That final chapters of A Short History… shadowed my own withdrawal from the local sound system and reggae scene. I was deeply involved but I was clearly wandering through that life with blinkers on. 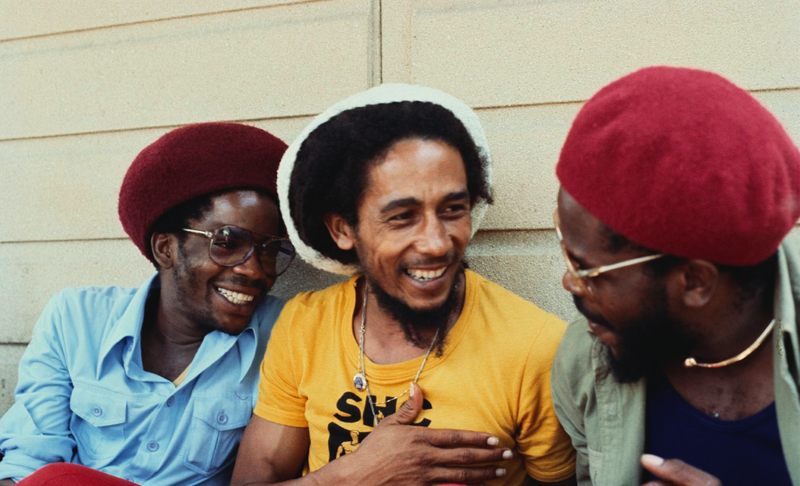 I’d met Dennis Brown a few times and his physical demise was truly shocking. Initially I could believe it when one of the girls from the youth club said, ” I just saw Dennis Brown in Ridley Road market and he looked like a tramp!” I thought, ” No. He’s an international star! Women love him. How could that be? ” Cocaine was the answer. Another story, which involved a fellow writer, took place in Errol Dunkley’s shop when a fierce looking beaver hat sporting gent asked where he might get “a teeth removed.” When the name of a dentist was proffered the gent shook his head and indicated that it was a bullet, not a tooth that needed removing. 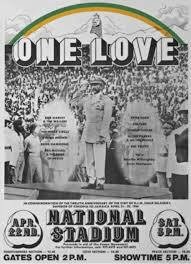 Around that time I was an avid follower of Coxsone OuternationalSound System. 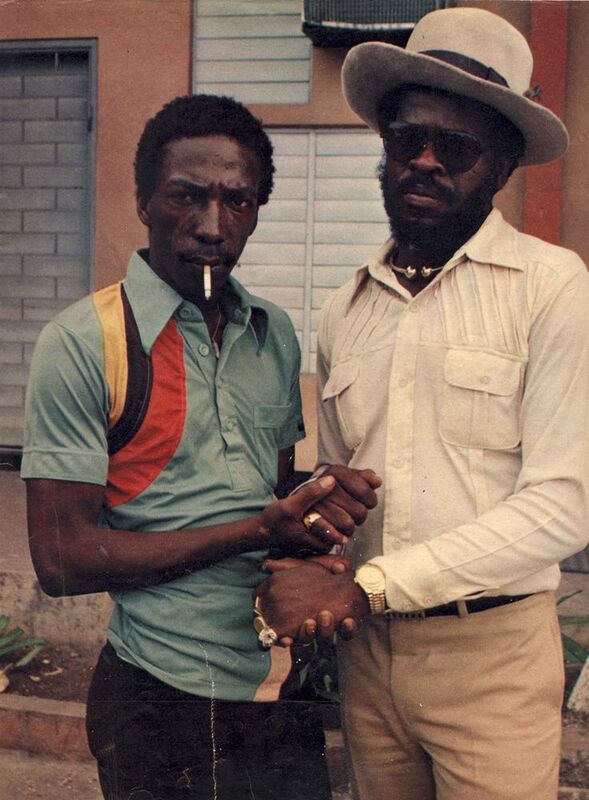 Lloydie Coxsone was one of the first people I interviewed. He’s a fantastic spokesman for sound system and has genuine gravitas. But as a Sound Man he has lived his life in that subterranean world and it’s not all “life, love and unity”. One day, I quietly and somewhat naively asked him why he had Ranking Dread on the sound. Basically, I’d never enjoyed his delivery on the mic – especially in a clash. Lloyd just said, “You have to encourage the youth.” I wasn’t convinced but in reality it wasn’t any of my business. Not long after that Ranking Dread made the headlines and it wasn’t related to his toasting. He made it onto the front page of the Daily Mirror and into the Guardian as “the most dangerous man in Britain and the Number One Yardie Godfather”. Apart from his dark and illegal runnings in Hackney he was wanted by Jamaican police in connection with over thirty murders! 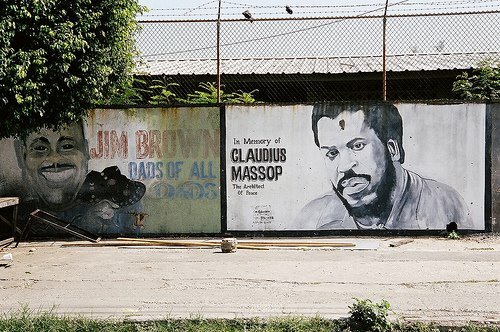 He was a friend of the late JLP enforcer Claudie Massop. The circle was squared and I needed to come up for fresh air. As I sit here writing this, almost four decades have elapsed since the raid on Hope Road, at my side is my old Goldring Lenco turntable and a constantly changing stack of much treasured pre-release 7″ singles that provide a lyrical soundtrack to Marlon’s book. Reading A Brief History Of Seven Killings was a deeply troubling but essentially cathartic experience. I found it difficult to put it down and straight after I’d finished felt compelled to cross reference by re-reading Laurie Gunst’s classic Born Fi Dead. I have a huge respect for Marlon James for the way he tackled this book – which has just been released in paperback by Oneworld. So, my friends, if you are in any way interested in the music driven culture of Jamaica and the deadly politics of its recent history you have to read this book. This entry was posted in Deep stuff and tagged A Brief History Of Seven Killings, Bob Marley, Born Fi Dead, Bucky Marshall, CIA, Claudie Massop, Edward Seaga, Green Bay Killing, Jim Brown, JLP, Marlon James, Michael Manley, Peace Concert, PNP, Smile Jamaica, Yardies. Bookmark the permalink.